the family home at 2, Curlew Cottages, Northfield Road, Boveney Newtown. He was not related to the other Boveney Newtown casualty of the Great War with the same surname. However he did have a brother William who served in the Dardanelles in 1915 and later on the Western Front. William survived the war. They had five sisters and all except the two eldest of the seven children were born in Northfield Road. The two eldest were born in London and came to Eton Wick on account of their father's work as a horse coachman. Unfortunately the father died of cancer in 1905 leaving a widow to bring up the large family. Two houses comprised Curlew Cottages, and another of the village's Great War fatalities, George Bolton, had spent part of his early life in the other house. Ernie attended the Eton Wick Infant School from 1899 until at the age of six years and nine months he left the village school to attend Eton Porny. In 1908, when he attained his 14th birthday, he left school to start work. By this time the family had moved a few houses along the road and were in No. 2, Oak Villas. On at least two occasions Ernie was mentioned in the Parish Magazine for good school attendance and good work. It is believed he found employment with Tom Lovell the local baker, Postmaster and general stores who traded at Ada Cottage, next to the Three Horse Shoes public house. Tom was a much-esteemed village man, for apart from being the principal trader he was also a school governor and frequently sang in Eton Wick concert groups. His son, Frederick Lovell was the village draper and boot dealer. No reference has been found to the date Ernest enlisted into the army, although it was probably 1915, when he was 20 years old. Certainly the 3rd/4th Battalion The Queens was formed at Windsor in June 1915. The following month they went to Tunbridge Wells as a unit of the 200th Brigade, 67th Division. In October the Battalion moved to Reigate in July 1916 to Westbere and in November to Ramsgate. On June 1st 1917 they embarked for the continent and landed at Havre. In all probability Ernie last saw Eton Wick and home during May 1917, prior to sailing to France. When the time came for Ernie to return to his unit, he started to walk the village road to catch his Windsor train. A local trader gave him a lift on his horse and cart, and with a parting gesture said "Cheerio! Ern' all the best and I will see you next time you get home". Back came the reply "Thank you Bert, but you will not see me again". This chilling expression or premonition was quite common among men who knew so much about the battlefield carnage. As privates they could not expect to survive 18 months before their next home leave was posted. Ernie arrived in the war zone in time for the bitter fighting of the Third Battle of Ypres that commenced on July 31st and raged on through the treacherous and drowning mud of Passchendaele. Almost tantalisingly the tiny place of that name, standing on marginally higher ground, became the objective of thousands upon thousands of weary, struggling soldiers. By October the battle had raged for nearly three months and British and Empire units became involved in an attack on the Broodseinde sector. The 3rd/4th Battalion of The Queen's Royal West Surreys were expected to attack and capture "Fudge Trench" allowing the 1st Lincolnshires to pass through their positions to further the planned advance. Other regiments, together with Australian and New Zealand units, were to simultaneously attack on the flanks. Advancing was very slow as the troops were obliged to file forward over duck boards which spanned the mud filled shell holes, all the time being subjected to intense enemy fire. It was during this action, on October 24th*, that Ernest Brown was killed. There are no details, his body was never identified and consequently there is no known grave. He is commemorated on a wall plaque in the Tyne Cot Cemetery along with approximately 35,000 other men who have no known graves and who fell in the battle in this sector. Additionally there are 11,000 graves in the same cemetery. 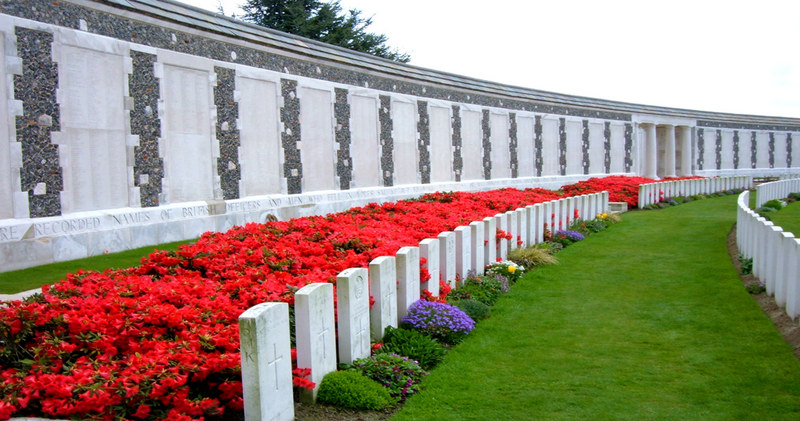 Tyne Cot is situated five miles north east of the Belgian city of Ypres. Ernest Brown of 2, Oak Villas, Eton Wick, second son of Mr Brown and Mrs Brown, aged 22 years, Faithful Unto Death, Grant Him Eternal Rest. Ernest was a single man. His name is sixth on the Eton Wick War Memorial and is also on the bronze tablets attached to the Eton Church Memorial Gates. Ernest Brown: The Commonwealth War Graves Commission page. 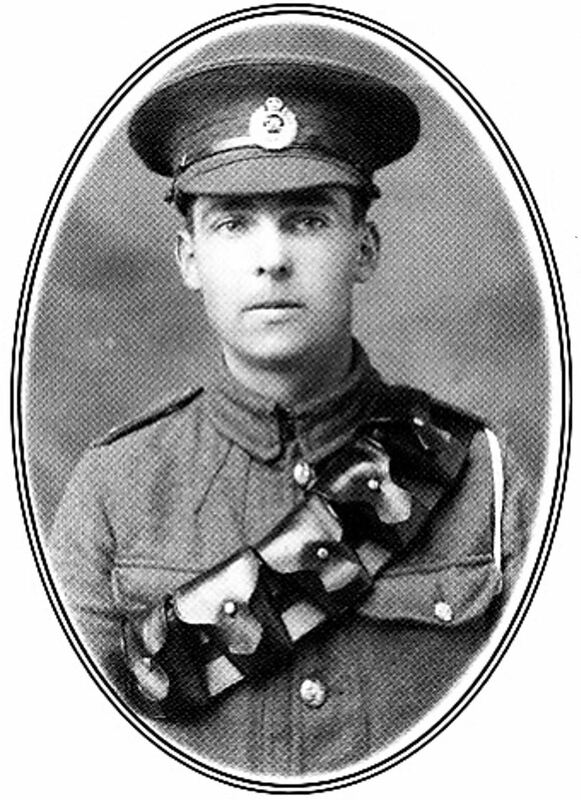 of Private Ernest Brown as 4th October 1917. Ernest Brown: The For King & Country page.